I love mince pies made with crispy, light filo pasty. I usually make almond-topped filo mince pies but this year I’ve also been making these samosa mince pies which are a bit different but also very easy. 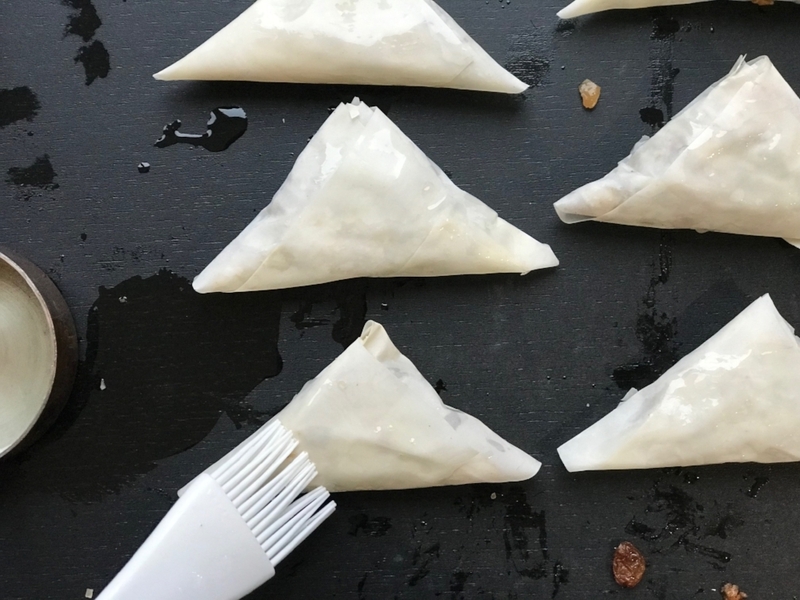 Scroll down for step-by-step photos of the samosa-folding. These samosa mince pies are also really easy to make vegan. I recently posted a recipe for homemade vegan friendly mincemeat but you can use shop bought. Ready made filo pastry is usually suitable for vegans. On good tip is to work quickly as filo pastry dries out fast. You could pop it on top of a damp tea towel as you work. 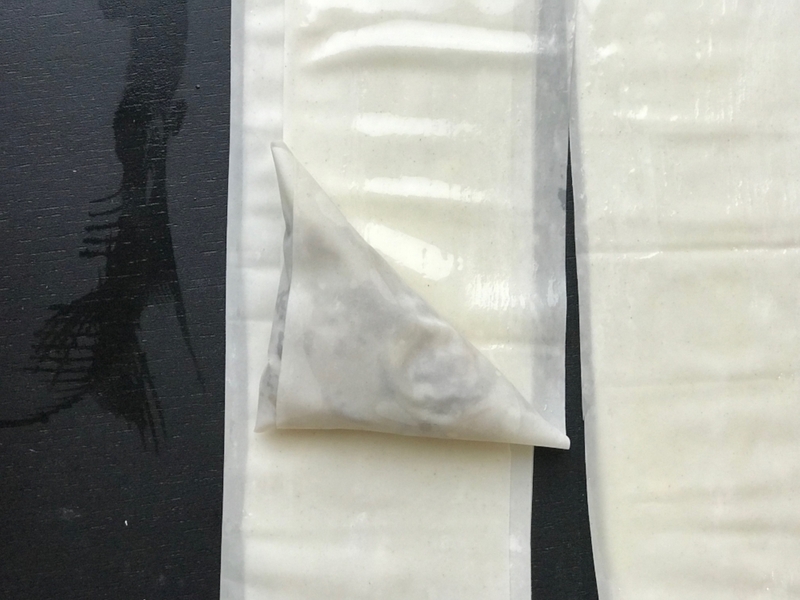 The folding is very easy - you will quickly get the hang of it. Just try and make sure there’s no holes where the filling can escape. Pre-heat the oven to 190 C / 170 fan / gas mark 5. Line a baking sheet with greaseproof paper. 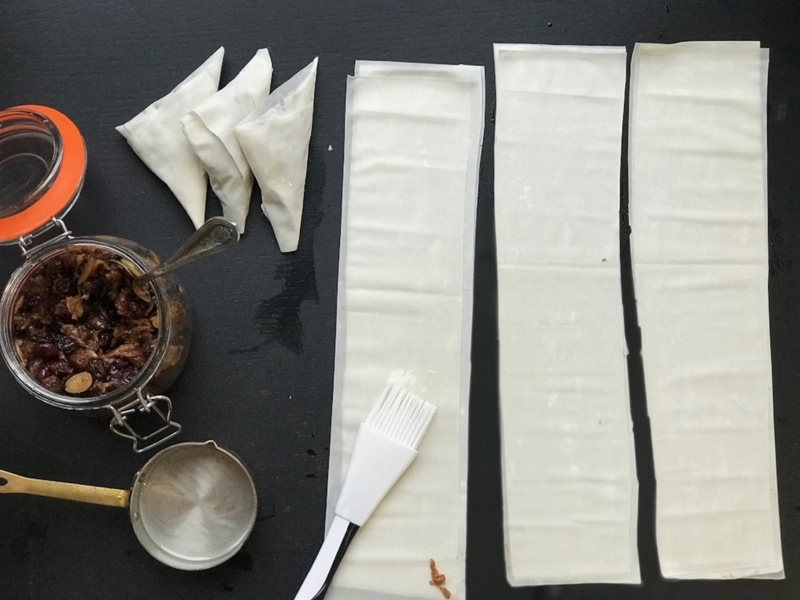 Lay the filo pastry sheets on top of each other and cut into three long strips with four long strips in each pile, making a total of 12 long strips. Work as fast as you can because filo pastry dries out quickly. Brush the three top strips of filo with oil. Place a tablespoon of mincemeat in the bottom left corner of each strip of filo. 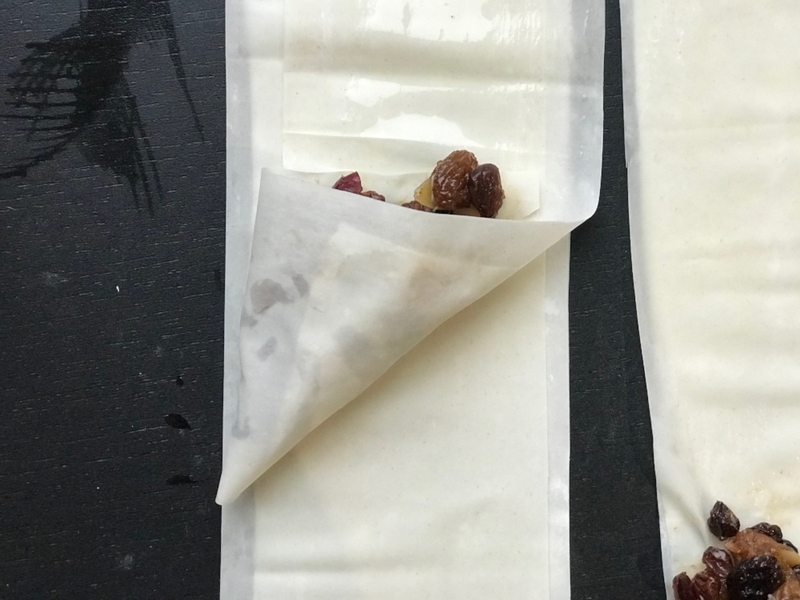 Fold the bottom corner across to the right and then up, and then across to the left and then up again and repeat until the mincemeat is enclosed inside a little triangular case of filo pastry. Scroll down for step-by-step photos of this method. Repeat step 4 with the other top two strips of filo pastry and then repeat steps 3 and 4 until all the filo pastry strips are gone and you have 12 mince pie samosas. Brush each mince pie samosa with a little more oil and sprinkle each with a little demerara sugar if you like. Transfer to the baking sheet and bake for 20-25 minutes until golden brown. Leave to cool. Dredge with icing sugar and garnish clementine zest to serve if you like. I’m linking this post up to #Blogmas2018 hosted by Naomi at Me Becoming Mum.